September 2013 - Deb Arnold, Ink. In this case, augmented reality. Might sound kind of space age and actually it kind of is. The Wikipedia definition: a live, direct or indirect, view of a physical, real-world environment whose elements are augmented (or supplemented) by computer-generated sensory input such as sound, video, graphics or GPS data. My simpler explanation: it’s stuff superimposed onto other stuff. Something like the next step up from QR codes (which when scanned with a smartphone or other device take you to a predetermined Web page or other destination), AR can be data that appears when you hold up your phone to, say, an ad. It’s essentially how Google Glasses works. Here are a bunch of other pretty cool uses as reported by Mashable. I recently helped a client with a presentation on current trends in recruiting (about which I knew little prior to the project, and can deftly pretend to know quite a bit about now). In that process I came across a particularly WOW example of AR. It’s not surprising that the military is often an early adopter of advanced technologies for recruiting. 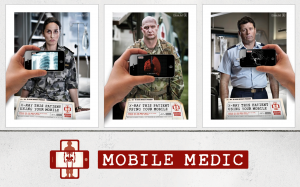 This case is no different – as the Australian Defence Force looked at using augmented reality to recruit top medical students. You’ve got to watch this video. Maybe AR should stand for Awesomely Rad.